Making cheap DIY Photovoltaic (PV) panels is not that difficult. What you need to have are some used solar cells and an interest in creating something useful out of scrap. If you search around, you will get enough solar cells to satisfy your needs. Some just need reconditioning but other may require total dismantling and reassembling. If you have basic knowledge of PV panels and have basic work skills, you can make relatively inexpensive panels which will work satisfactorily. When others spend thousands of dollars on a new home solar kit, you can have them at very low cost or no cost at all if you use used solar panels to make homemade PV panels. The greatest advantage of utilizing reconditioned method is that you can make them yourself. 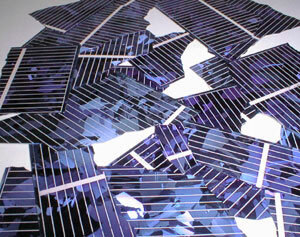 First, collect as many used or broken PV panels as you can. Dismount the solar cells from the base on which they are mounted. Then check the cells for their condition. Fix the loose connection by soldering them. If the diodes are unfit, replace them either with diodes taken from other used solar panels or with new ones bought from a dealer of electrical supplies. If there are loose cell connections or malfunctioning diodes, your reconditioned panel will not produce energy when it is set up. If there are damaged solar cells, replace them with either old cells from other used solar panels or with new ones which you can buy from your local hardware store. Even if you don’t replace a few damaged cells, it doesn’t matter much because the panel will still produce electricity albeit a smaller amount. Photovoltaic cells on a solar panel are arranged on base. Even if you do away with this base, your reconditioned PV panel will work for a few years. There are a number of benefits in building a reconditioned solar panel via Do It Yourself (DIY) approach using components from used solar panels. Firstly, a reconditioned panel will cost you practically nothing. Secondly, it is very easy to get second hand solar panels free of cost. Another benefit is that you can gain experience in assembling and mounting the panels without the fear of damaging expensive components of a new solar panel. But remember, there are some disadvantages also. A reconditioned solar panel doesn’t last long. The power produced by the reconditioned panel will be less than the output from a new one. However you try, you won’t be able to correct all the faults of a used panel and it will need recurring repairs. If you are very careful while rebuilding your Photovoltaic panel, you can minimize the chances of a total failure of your rebuilt panel but you can’t make it work like new. However, if you consider the amount of money you can save by reconditioning used solar panels, it is worth the trouble. You can also be proud of having made something useful out of waste materials. To get raw materials for your DIY project, you can ask the home solar system repair services of your area or you can directly contact some home owners who might give you used and broken solar panels free of cost. A little bit of creativity, patient and hard work will go a long way in setting up a residential solar power system without spending a lot of money. For more information on how to get started on a DIY PV panel project, check out the Power4Home system by John Russel. Read up on the Power4Home review on this blog for more details.